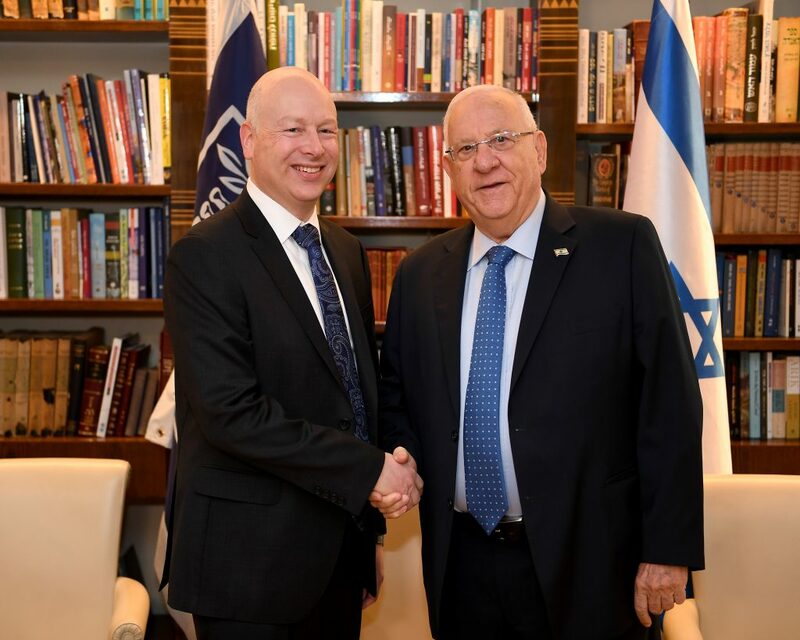 President Trump’s special envoy Jason Greenblatt concluded his first official visit to Israel and the Palestinian Authority on Wednesday with a meeting with President Reuven Rivlin and Coordinator of Government Activities in the Territories (COGAT) Yoav Mordechai, and he was scheduled for a follow-up to the 5-hour meeting with Prime Minister Binyamin Netanyahu before returning to the U.S. This was in line with a report on Tuesday in Hamodia, which stated that Greenblatt was seeking tradeoffs between the Israelis and Palestinians on relatively easy issues, such as Palestinian agreement to cease incitement in return for a U.S. undertaking to shelve the proposal to move its embassy to Yerushalayim, before proceeding to the tougher ones. Mr. Rivlin and Mr. Greenblatt agreed that the security of Israel and its citizens was also critical to any peace settlement. Also on Wednesday, Mr. Greenblatt went to the Palestinian forces’ main training base in Jericho, which was established with American funding. He met with several senior Palestinian security officials and noted that the American assistance is designed to help the Palestinians fight terrorism and to provide security to both Palestinians and Israelis. “We received Greenblatt as a representative of the U.S., and we appreciate and welcome the fact that he is open and wanting to listen to the Palestinian side,” said Husam Zomlot, a senior adviser to Palestinian Authority President Mahmoud Abbas. “This is a good start.” Zomlot starts his new job as the Palestinian Authority’s ambassador to the U.S. next month. Mr. Zomlot said that Mr. Greenblatt spent hours in Ramallah listening to the PA leader and some of his senior advisers. But Mr. Greenblatt’s mission was not merely “fact-finding,” as it was sometimes described. In addition to the suggested confidence building measures, he had some diplomatic firepower as well. According to the Palestinian daily al-Quds citing sources in the U.S. Congress, the envoy warned Abbas that American lawmakers seek to set conditions for continued economic aid to the Palestinians on ending incitement, including payments to the families of Palestinian terrorists. Former Israeli ambassador to Washington Michael Oren, currently a Kulanu MK, summed up the change of atmosphere in Mr. Greenblatt’s visit. Oren recalled that when former President Barack Obama took office, he appointed George Mitchell as his special envoy and proceeded to tell the sides what peace would look like. That approach proved too rigid for either side to work with, and the peace talks eventually stagnated.